To make the gremolata, finely chop the mint, parsley, garlic and lemon strips, then combine well. Heat a chargrill pan or barbeque plate to very hot. Lightly brush with 1 tablespoon of the oil. Cook the cutlets over medium heat for 2 minutes on each side, or until cooked to your liking. Remove the cutlets and cover to keep warm. Trim the ends from the carrots and zucchini and peel the vegetables lengthways into ribbons. Heat the remaining oil in a large saucepan, add the vegetables and toss over medium heat for 3-5 minutes, or until sautéed but tender. 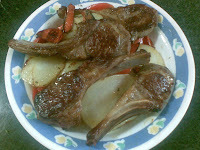 Divide the cutlets among the service plates, sprinkle the cutlets with the gremolata and drizzle with the lemon juice. Serve with the vegetable ribbons.